In this article, we will develop an Android application which facilitates users to tap two locations in the Google Map. On taping the second point, a driving route will be drawn in the Google Map Android API V2 using Google Directions API. 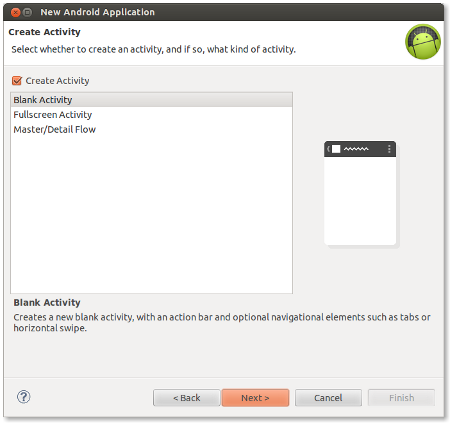 This application is developed in Eclipse (4.2.1) with ADT plugin (21.1.0) and Android SDK (21.1.0) and tested in a real device (Android 2.3.6 - GingerBread ). Google Map for Android is now integrated with Google Play Services. 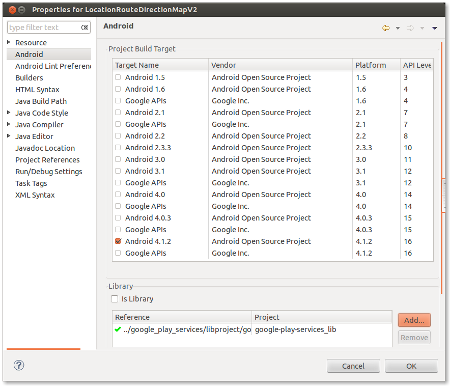 So we need to set up Google Play Service Library for developing Google Map application in Android. 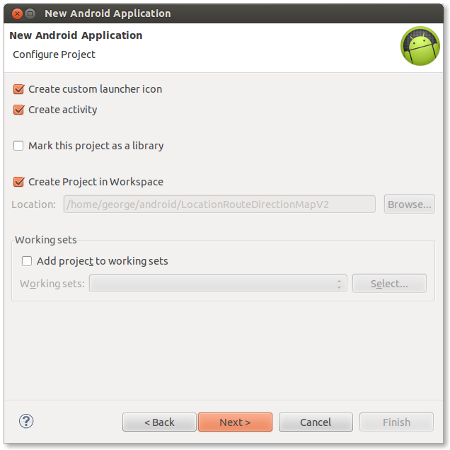 Please follow the given below link to setup Google Play Service library in Eclipse. We need to get an API key from Google to use Google Maps in Android application. Please follow the given below link to get the API key for Google Maps Android API v2. * for the end location, the color of marker is RED. You can hire me on hourly basis or on project basis for Android applications development. For hiring me, please mail your requirements to info@wptrafficanalyzer.in. very useful tutorial. but i want to ask you, how do I know distance traveled and a travel time to a destination specified by the user? I hope to find out information quickly. once again, I say many thanks. hi. thanks for this tutorial. If i want calculate the shortest path. Can u help me? yes it`s linked with Google Play service but showing warning + error also “Google play store missing” i found solution on other link they are installed gsm.apk ,vending.apk file on emulator it`s correct i tried but didn`t get any correct solution. Do you know how i can show the local traffic?? Also here. I change my API KEY but the map doesn’t show. Hi, I tried to application but I have error. Error is null pointer exception.Please can u help me? Awesome. It works perfectly. The next what i want to do is create some progress bar while information is proccessing (it did relatively fast ). Great…! 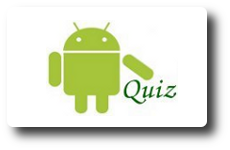 can i use this source code APK file in my 2.3.6 api Android Samsung mobile phone.? I got force to close message in my android phone. please help me to solve this prob. 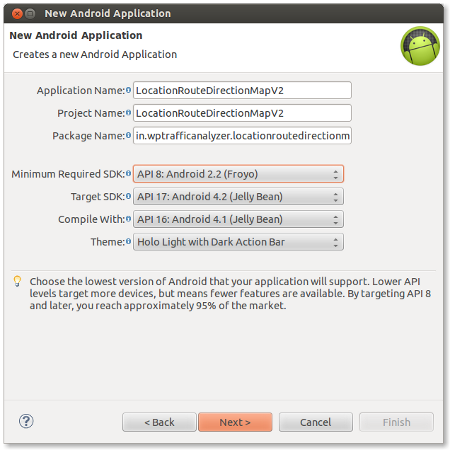 nice tutorial, but i want to ask you, how to combine this tutorial with your tutorial “Android Geocoding – Showing User Input Location on Google Map Android API V2″ ?? 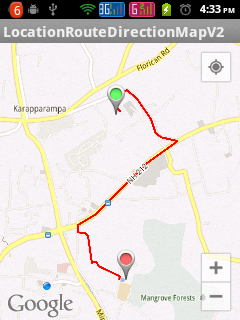 I would like to develop Map Tracker view like Open GPS Map Tracker. How can I develop this please produce one of the tutorial on the basis of that. I want to mark my second position as current to dram route from the location where i first clicked upto the current location where i am present, how can i? I have tried this tutorial to run on EMULATOR,this is working well till displaying two MARKERS on MAP where I have clicked but this is not not showing any route between these two MARKERS and then getting crashed. Can you please help me out. Could you help me, please! Thanks for this great tutorial, however, just as other people said, there is no any route between the two markers (origin and destination).I used Log.i to debug, found result.size()=0 at class ParserTask. Maybe there is something wrong when parsing JSON format. Sorry, this tutorial has no fault because I tested the web version, there is no route either. Please check you are getting a valid json data containing direction details from the function downloadUrl(). you are an excellent programmer.. thank you very much.. I use part of you code and work fine! Really thanks!! The Google Play services resources were not found. Check your project configuration to ensure that the resources are included. Failed to load map. Error contacting Google servers. This is probably an authentication issue (but could be due to network errors). Hi, george can you help me? very nice tutorial , its working perfectly.. Thanks a lot.. When I use the apk file in Samsung 2.3.6 version.I got force to close message in my android phone. please help me to solve this problm. Hi,may I know how can I get turn by turn direction using text view? For example turn left at 50 m, turn right at 100 m to get to the destination? Appreciate if anyone can help me Thank you. this is shortest path? it is Djikstra or greedy method? 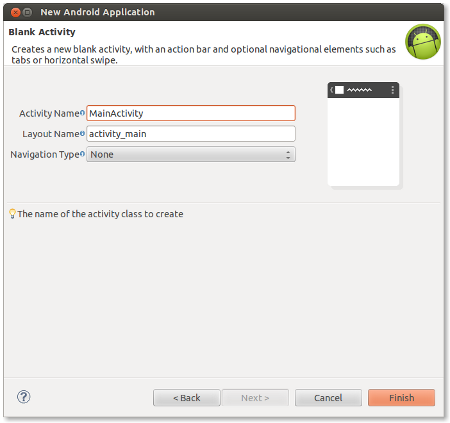 Hi I tried this tutorial but the app is getting closed in android device. Please help me to resolve this. a) how can i get the latitude and longitude from the current location far 100 meters to find out the curve of road or turn found and find the angles. sir i tried google android api to draw directions between two points. its going well. i want to know how the show the direction in text form i.e like this “take right 100m, take left t0 200m”. please help me out. if possible send the code for doing this. How can I move my current pointer on the direction route, So that i can have navigation. What do I need to change in the code if I want to draw line from a current location(setMyLocationEnable) to a marker by just click on the marker? I’m getting a NullPointerException, because the value of result size is 0. I verify the log and the json output is got correctally. Which can be my problem? (The problem isn’t on the Parser). Thanks in advance. Hy there , is there an posibility to get all intersections from a route? Pls any one do the need full. Hello. Nice tutorial. Can you please tell how can we display the traffic information on the routes ? Thanks for the tutorial, I need one more help that how can I make Geofencing to track that I am following correct route and I will get a alert If I am on wrong route. I have a code to markers to a set of locations on google map v2. And I need to add a feature where driving route will be shown when u click on any one marker from source marker. Could you please add a tutorial for that? i want a idea for make a app for public transportation. Is for 30 bus. each bus have one route. i want to know how i can if the user want go to some direction what bus or buses he has to take for go to that direction. Now, I am doing the same but taking user input as entering location. for that i am using place api.. which returns lat and longitude of both to and from and the i pass it within this..
i am merging ol.. yess.. i am getting the result but kinda conflict is there can u link me any example of doing the same. I want to highlight different alternatives between two places. This program just highlights one route. But plz guide me How to get shortest route from my location to more then one location. Thank you for this helpful code But plz tell me how to add third marker in this code plz help me. thank you for this, it a great bit of code. i want to know if there is a way to add traffic information to the app gotten from a user. like if i state there is traffic on this route then the next user on the same route will be given a different direction. any information will be helpful. thank you very much for this, it a great bit of code. Thank u so much! Got success at first attempt.. . Your codes are working but i have to pass the origin and destination latlong value manually without touching the map i have to show the path when the activity starts. Hi George I want to do real-time tracking Gps Please can you help me thank you very much . Thanks for the code. But this code by default draw the route according to the “right lane”.But i live in a country where the drive lane is left. Please suggest the code changes for this . thanks this is a great tutorial. I want to put first marker as my current source location that is first appeared on map in blue dot. means 1st marker will be automatically appear on current location which is in blue dot. how can i do that in this code? Does it give the shortest distance between the two points? Is it possible to find the optimum distance between 3 points through GoogleMaps API-for delivery purposes…. I look forward to hear from you. can i use this in android studio? why is it needed in the permission, should I also use it? This code helped me a lot, guy! Is it possible to save the JSONObject to be parsed on a server and then retrieve it later to draw the route at a later time? this example draws on path between two points. What if we want to draw all possible paths between two points.How can that be done? Thanks.. very nice example.. working great. This line should be inside the loop. i want to take source as my current location and ask detination to user.the route between these two place shold be shown and travell time and distance also sholud be shown..what can i do ? Can you please tell me what I should do to draw multiple routes between multiple locations? Its pretty urgent. Should I make changes regarding url and downloadtask statements in onCreate function to mark multiple routes? Copyright © 2019 Knowledge by Experience. All Rights Reserved.